Before purchasing boots for the slopes, be sure that the shell sizing for ski boots is correct so you can ski in comfort and have greater control. The single most important piece of ski equipment is your ski boots. Your ski boots connect your feet to your skis and the snow. The better your boots fit, the more control you will have when skiing. 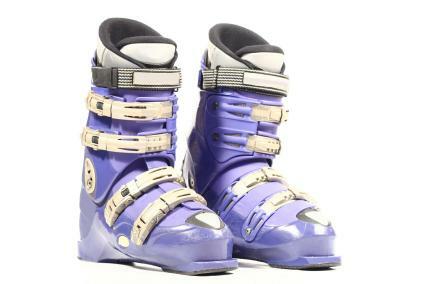 Every ski boot consists of a hard outer shell and a soft inner lining. The outer shell is made from a stiff plastic. It is important to buy the proper shell size because it will not flex or change at all. The outer shell is what gives you control and stabilizes your feet and ankles. The inner boot lining is made from a soft padded foam material. It is designed to protect you from impacts and will keep your feet warm. Always make sure that the boot lining is snug and matches the shape of your foot. The lining will provide you with comfort when skiing and will change over time as it compresses in the shell. To get properly sized for your ski boots, go to a professional ski or sport shop. Be sure to wear a thin pair of socks so you aren't adding extra bulk. The only thing you should wear with your boots is a pair of socks. There is no need to tuck in pants or add anything extra to your boots. Shell sizing for ski boots is the main way to determine your proper boot size. It is important to have a trained technician fit you for your boots. In doing so, the technician will first measure your foot in the shell of the boot without the inner lining. To fit properly, two fingers should fit behind your heel when the foot is forward in the shell and the shin is resting against the front of the boot. A plastic boot shell will not mold to your foot so take your time when choosing a boot. A technician will usually have you start by trying a boot on that is a size smaller than your street shoe size. An oversized ski boot can lead to a sprained ankle, or worse yet, a broken bone. Boots that are too big also hinder skiing and can cause you to get tired quickly. A beginner should choose a softer and more padded boot. Advanced skiers prefer a stiffer boot with a thinner lining for more speed and control. Ski boots do not last forever. It is important to inspect them at the beginning of each season for wear and tear. Check and make sure that the shell is free from cracks and damage and that the lining does not have any holes or wear. It is also essential to make sure that all of your ski equipment is safe and inspected each time you plan on using it.